QUICK JUMP: Contestants Pageant Information How to compete in Miss Universe Venezuela 2014? Miss Universe Venezuela 2014 was crowned on October 9th, 2014 during the Miss Venezuela event held in Caracas, Venezuela. 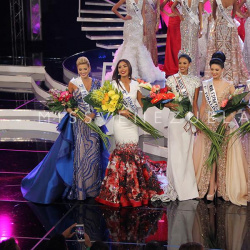 The event sees the crowning of four queens; the countries' representatives for Miss Universe (Miss Venezuela Universo), Miss Earth (Miss Venezuela Tierra), Miss International (Miss Venezuela Intenacional) and Miss World (Miss Venezuela Mundo) crowned of the same evening. The pageant saw 25 regional winners, from across the country, come together to compete to be Venezuela's representative in one of four of the world's biggest international pageants.